A fall is an unintentional loss of balance causing one to make unexpected contact with the ground or floor. Accidental falls are one of the most common events that result in injury in pediatrics. Falls also occur as a part of the normal development of children as they learn to walk and run. Children in the hospital may be at a higher risk for a fall with injury due to their medical condition, an existing injury, or because of certain medications they are taking. The hospital environment is also different than the one at home. 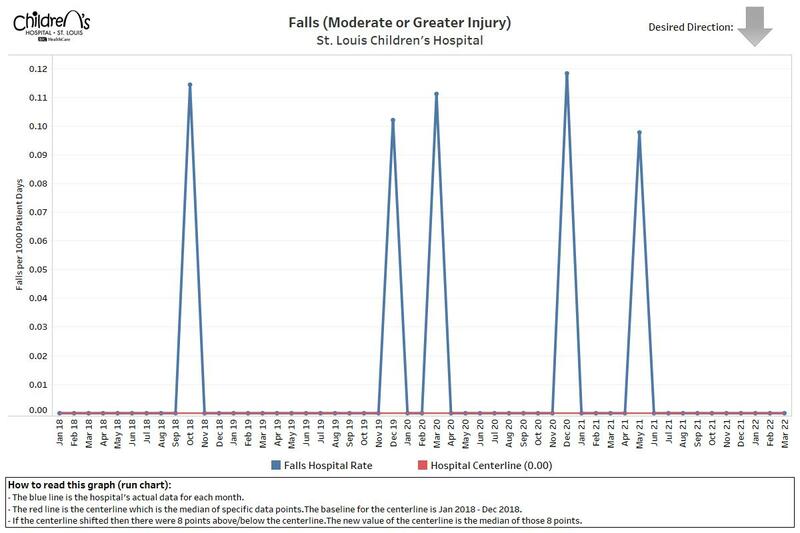 These factors can increase the risk for a fall, so St. Louis Children’s Hospital takes precautions keep patients safe and prevent injury in the hospital environment. The number of falls per 1000 patient days. Each day a patient is in the hospital counts as one hospital day. Upon admission, all patients are screened by a nurse for their risk of falling within the hospital. Additional screenings for falls are conducted when necessary. Patients at risk for a fall wear a yellow armband that identifies them as “high risk.” As a result, staff knows to take extra precautions to keep patients safe. Patients are provided with non-skid socks to wear when they are out of bed and will be assisted when walking. What can families do to help prevent falls? Parents/caregivers are advised on how they can partner with their care team to help keep their child safe in the hospital environment. Make sure your child’s bedrails are up.